Much like assembling a puzzle, place the ground planes together to manipulate it as one unit. 1. Our ground planes use 2000 as a base unit. Therefore, you can use the Transform tool to easily link each floor seamlessly without fine-tuning. 2. Place the ground planes via the Move Transform menu, arrange in many different combinations in order to create a customized terrain. When you need to use smaller grounds, you can adjust the ground size and tile UV to solve this problem. 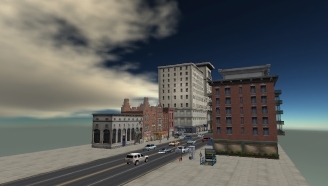 Import various buildings and position them as you like. When combining Building, part of the shop may be covered by building walls. 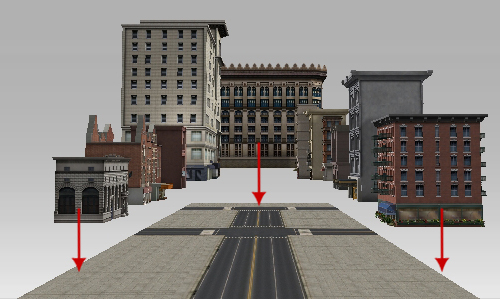 You can make Opacity textures for the building to solve this problem. Make a Opacity texture (The black area will not be displayed), and load Opacity Channel. The shop will no longer be covered. 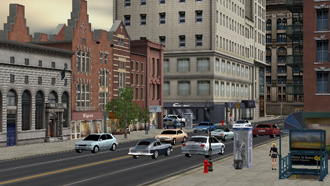 Import floors, buildings, street lamps, phone booths and cars to arrange your street block. When there are many props in a scene, we sometimes need to attach props to make it easier to move as one unit. 1. Arrange the props to the position that you want them to be. 2. Choose a prop, and click the Pick Parent button.